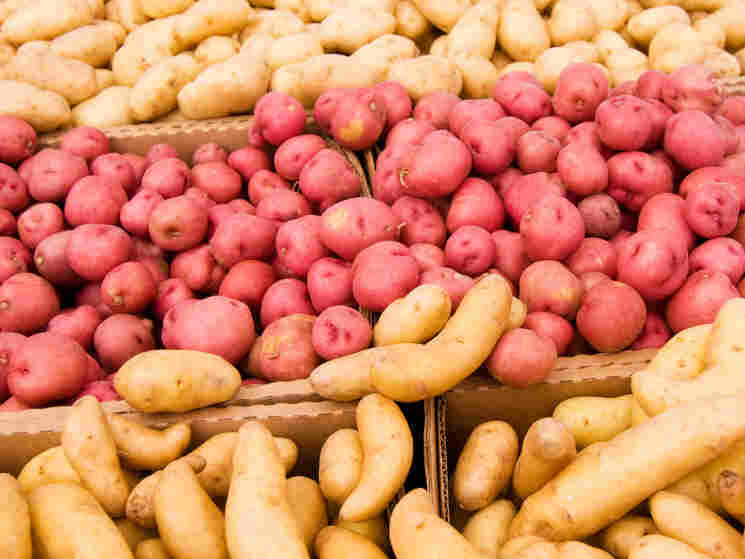 Can Potatoes Give Your Health A Boost? A Chemist Thinks So : Shots - Health News Potatoes may lower blood pressure if they're cooked right, according to new research. Beneficial compounds in potatoes may survive microwaving better than deep-frying. And avoiding the extra fat may make the weight gain linked to potatoes in other studies less likely. Potatoes have gotten a lot of bad press as major contributors to obesity and diabetes. But Joe Vinson, a chemistry professor at the University of Scranton, aims to rehabilitate the humble tuber. When he had overweight people eat potatoes daily for a month, their blood pressure dropped, and they didn't gain weight. That's far different than the current line on potatoes. In June, researchers at the Harvard School of Public Health reported that potatoes were a key culprit in weight gain, more so than red meat or sugary drinks. That study was published in the New England Journal of Medicine. But Vinson thinks the Harvard unfairly lumped together fries with healthier baked and steamed potatoes. He thinks that beneficial antioxidants in potatoes are destroyed by frying, that that the microwaved potatoes his test subjects consumed should still retain contain those good vitamins and polyphenols. His study was small, with just 18 subjects eating 6 to 8 microwaved potatoes twice daily for one month, then going potato-free. After eating potatoes for a month, their diastolic blood pressure dropped an average of 4 millimeters of mercury, or 4.3 percent. Vinson had his subjects eat fancy purple potatoes because they have higher levels of compounds like clorogenic acid. Vinson had done earlier research on beneficial compounds in coffee, and was surprised to find that chlorogenic acid, a major bioactive compound in coffee, was abundant in potatoes, too. That sparked this study. He hopes to repeat it with regular potatoes. "The big question in my mind is whether white potatoes would work," Vinson told Shots. He hasn't found earlier research on potatoes of any color and blood pressure. "How come somebody didn't do this before?" the chemist wonders. "You ask yourself this question in science." Potatoes of all hues contain vitamin C, folic acid, potassium and iron. In the old days sailors ate potatoes to stave off scurvy, and potatoes remain a major source of nutrition for millions of people around the world. So potato fans have a choice: Experiment with Vinson's "potatoes can be good for you" theory, and start nibbling microwaved tubers. Or stick with the mainstream view espoused by Willett, and presume that there's no such thing as a healthful spud. Vinson's findings, which haven't been published yet, were presented at a meeting of the American Chemical Society in Denver. Funding for the work came from the U.S. Department of Agriculture's State Cooperative Potato Research Program.